Our church used Treasures of the Nile in 2004. We had a blast making lasting projects from recycled and inexpensive items. The walking sticks were a favorite with kids and adults alike! 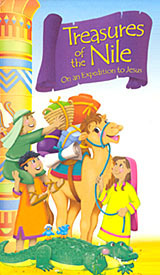 Treasures of the Nile is an Egyptian-themed VBS. Most of my notes are on my old computer which crashed in Oct of 2004, so if this particular theme seems a little sparse, that's why. Pictures glued to projects make a nice touch. Place several on one page and have them color copied at a copy center to avoid runs when glue touches the ink. Or use a projection machine and this clipart to make posters to decorate classrooms, etc. CD Suncatchers - Glue two CD's shiny sides out. Have children glue shiny confetti, etc. to the CD's. Glue the Bible verse to one side. String shiny curly ribbon through the CD's for a hanger. Cross Suncatchers - Cut two rectangles from clear contact paper. Have children place tissue paper scraps flat onto the sticky side of one piece of the contact paper. Place the other piece sticky side down on the tissue paper (so that the tissue paper is sandwiched between the contact paper). Cut a cross shape from the tissue paper. (Any other shape works as well.) Punch a hole in the top and string ribbon through for a hanger. Necklace - Pre-paint large rotini noodles in bright colors. (The cheap acrylic paint in 2 oz. bottles works well for this.) Have children string them onto a piece of yarn. Walking Sticks - Tear t-shirts into strips. Wrap strips around the top of the stick creating a hand guard / handle. On each loose end of t-shirt material, tie a large wooden bead. This was a favorite at our church with children and adults alike! Mason Jar Bank - Have children glue tissue paper to jar for a stained glass effect. Use jar rings but NOT the metal inserts. Place corrugated cardboard where the metal insert would normally go with the space for coins pre-cut. Glue Bible verse to one side of the jar. Pringles Can Bank - Wrap a piece of paper around a Pringles' can and have children decorate it. We did this for 3-4 year olds using blue paper. We had children glue sand to the bottom of the paper. Then, they glued a brightly colored treasure chest which had the words "Jesus is My Treasure" to appear as if it was resting on the ocean floor. Then, they finished off with stickers depicting sea life, etc.